Golf Festival at World Golf Village is Back! The 3rd Annual Golf Festival at World Golf Village is back September 23rd – 25th and is bigger and better than ever! This free event is open to the public and features fun for golf lovers of all ages. Swing by for free interactive golf clinics, appearances by Hall of Fame members, free family golf, live music, Demo Day, a kids’ zone, food trucks and free Hall of Fame admission. Beer and wine will be available for purchase. The event will start with a Kickoff Tournament at the Slammer & Squire on Friday, September 23rd, followed by the Grace & Grit Exhibit Opening at the World Golf Hall of Fame. Tournament awards will take place at Murray Bros Caddyshack afterwards. Saturday, September 24th will offer a full day of family fun with Q&As with Kathy Whitworth and Grand Champions, live music by Charlie Walker & Dustin Bradley, Elite Putters Club Putting Tournament for juniors and Challenge Hole Contests. Kids will love the bounce house and airbrush body art! The Demo Day will feature Callaway, PING, Titleist, Nike and more at the Slammer & Squire. And, make sure to register for the Adult-Junior Hall of Fame Golf Tournament on Sunday, September 25th at the Slammer & Squire. An Awards Dinner will take place after the event at the World Golf Hall of Fame. 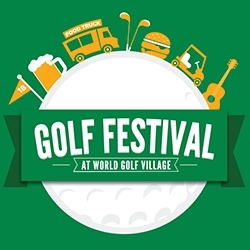 For a full list of activities, please visit http://www.worldgolfvillage.com/golf-festival-2/.